ABC’s second coming of Roseanne -- and its 10th “nuclear family” comedy this season -- deploys heavy-handed humor dispensed by a fat wife and mother of three. The word “fat” may be politically incorrect, but is permissible in this review because American Housewife uses it with such abandon in Tuesday’s premiere episode. Katie actually is more chunky than fat. But for the purposes of this series, she might as well be the Goodyear blimp. Every physically fit adult female denizen of Westport is her enemy, except for Katie’s two unaccountably trim best friends, Angela and Doris (Carly Hughes, Ali Wong). Spotting three moms outside the school where she’s dropping off her younger daughter, Katie rages, “Flat stomachs, tight, high asses, thighs that don’t touch and those stupid, green drinks!” It gets old in a hurry. Katie’s resilient husband, Jeff (Diedrich Bader from The Drew Carey Show), is first seen “at rest in his natural habitat,” which happens to be on a toilet seat with his pants down. Unlike John Goodman’s Dan Conner in Roseanne, he’s not a hefty match for his constantly carping wife. But in many ways (besides Roseanne being far funnier), that’s one of the few differences between these two sitcoms. 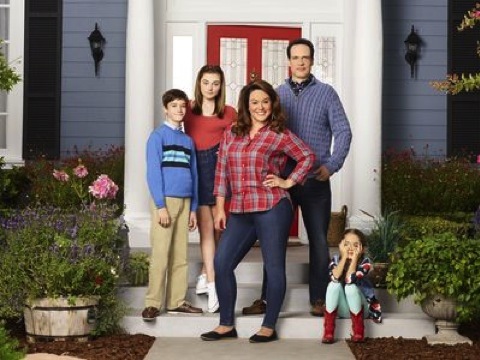 American Housewife even premieres on the same night and time -- Tuesday, 7:30 p.m. (central) -- that Roseanne did back in October, 1988. American Housewife also borrows from Family Ties by making the middle son a facsimile of Michael J. Fox’s very Republican and capitalistic Michael P. Keaton. Oliver (Daniel DiMaggio), named Harrison when ABC announced its pickup of American Housewife, has a sole goal of becoming rich. He’s a devoted member of his school’s stock market club and gets quite upset when mom takes away his money jar after he’s fingered for donating expired cat food to a food drive. The other kid is Anna-Kat (Julia Butters), who in Episode 2 wails, “Mama, Oliver hit me in the nuts.” No, the humor is not subtle. Katie, who favors plaid, flannel shirts in the mode of Roseanne Conner, brays her way through the first episode in ways that too often make her off-putting rather than a down-to-earthy role model for plus-sized women. Westport, Conn. is portrayed as a citadel of rich, pampered, condescending skinny-dom, with Katie sourly hammering away at anyone who dares to even wear a Fitbit. She’s also determined to replace the unseen “Fat Pam” with someone of equal proportions. A woman built like the Michelin Man more than qualifies until Katie discovers that her impending new neighbor also has an aversion to wealthy blacks and anyone who’s gay. This is resolved in the end with anything but a light touch. Mixon brings some presence to her starring role while the battle-tested Bader ably and dutifully plays ABC’s latest roll-with-the punches, quieter hubby. Each of the first two episodes end on gooey notes, with Katie re-embracing the weight she proudly stands behind and then the joys of being a stay-at-home mom. Comedies with women figuratively wearing the home front pants are plentiful on ABC. And there are several very good or promising ones, including The Middle, The Goldbergs and this fall’s new Speechless. American Housewife so far is too busy taking offense to be much fun to watch. “I will not have that in this house!” Katie bellows when daughter Taylor dares to brandish a green-colored health drink. The kid is only trying to take care of herself. This comedy still has much to do on that front.